ATAC is one of the largest European local transport companies. 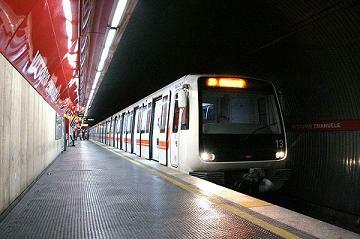 The company provides the local public transport in Rome (metro, tram, bus) and the Rome-Lido railway line. 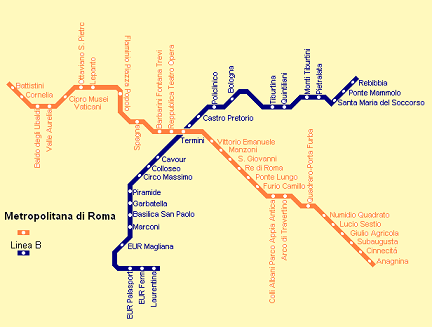 At this moment there are two metro lines in Rome: line A and line B. Total length of the two lines is 38 km with 49 stations. The two metro lines crosses each other at Termini railway station. Rebibbia, Ponte Mammolo, Santa Maria del Soccorso, Pietralata, Monti Tiburtini, Quintiliani, Tiburtina, Bologna, Policlinico, Castro Pretorio, Termini, Cavour, Colosseo, Circo Massimo, Piramide, Garbatella, Basilica San Paolo, Marconi, EUR Magliana, EUR Palasport, EUR Fermi, Laurentina The first train runs at 5.30 and the last at 23.30. It starts at Roma Piramide (line B) to the coastal city Ostia. Many citizens of Rome go to Ostia for the beaches and sea. Tickets can be bought at tobacconists and from vending machines. Also from ATAC ticket offices in the following metro-train stations: Battistini, Cornelia, Ottaviano St. Peter, Lepanto, Flaminio, Spagna, Termini, Anagnina, Laurentina, Eur Fermi, Ponte Mammolo. The tickets are in use from the moment they have been stamped. The Roma Pass cost €38.50 and offers unlimited travel in the public transport for 3 days and discounts in museums, shops and theatres. The first two participating museums/archaeological sites are free. Roma Pass users are entitled to skip the line. At the Coliseum a reserved turnstile is available for RomaPass holders. Advantage is direct access to the monument and avoiding the long queues.